Just a quick note to let you know how our adopted puppy-boy Ozzie is doing! He was formally known as Kettle and we brought him into our home in January 2004. 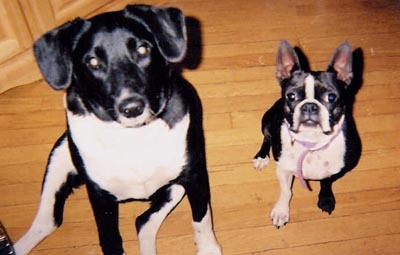 At first Ozzie was skittish, timid and afraid of anybody entering our home, but that quickly left him as he became comfortable with his surroundings, family and Boston Terrier sister, Pebbles. He's a great companion for Pebbles and they constantly play hide and seek their bones, race around the backyard and play tug of war with their soccer ball. Ozzie even shares his bed with Pebbles! He loves taking walks with his five lab buddies and his short little legs keep right up with their pace, often making him the leader! He's quite the park goer! Although we were not looking for a watchdog, he's protective of us and has quite the bark! We truly lucked out by adopting Ozzie. He brings unconditional love every time we enter our home and he has brought much joy and companionship. We are looking forward to celebrating his first Christmas and thank you once again for letting us adopt him.